SAN ANTONIO (CNS) — One of the “most critical and perhaps dramatic signs” of the times is “the tremendous growth of the Hispanic population,” said Arturo Chavez, president and CEO of the Mexican American Catholic College in San Antonio. That growth presents a challenge to the Catholic Church to meet the pastoral needs of Hispanics but also to cultivate leaders from that population, he said in a keynote address at a one-day symposium on Hispanic leadership and philanthropy in the 21st-century church. The first-of-its-kind gathering drew Hispanic and other Catholic leaders from across the nation to San Antonio June 25. The University of the Incarnate Word hosted the event. It was co-sponsored by Foundations and Donors Interested in Catholic Activities, known as FADICA; the National Leadership Roundtable on Church Management; the Mexican American Catholic College. Kerry Robinson, the Leadership Roundtable’s executive director, said she hoped the day would provide “a space for dialogue and engagement” among those in attendance, who represented 37 dioceses in 23 states. Alexia Kelley, president and CEO of FADICA, announced the day was dedicated to the memory of the late Sister Dorothy “Dot” Ettling, a member of the Congregation of the Sisters of the Incarnate Word. Founder of the host university’s Ettling Center for Civic Leadership, she and Chavez had provided the initial spark for the symposium. In his keynote, Chavez said there are an estimated 54 million Hispanics in the U.S., though the actual figure is much higher, he noted, and more than half of these are under age 30. This population is growing not only in San Antonio, but in little towns in Kentucky, Arkansas and other communities, where parishes are struggling with ways to respond. “Three-fourths of the church that is under the age of 25 is already Hispanic and this continues,” he added. Noting the term “Hispanic” only exists in the United States, he explained that elsewhere people are differentiated as being Cubans, Ecuadoreans, etc. “Hispanic” and “Latino” were used interchangeably during the symposium. The Catholic Church, which has held an important place in U.S. society, has always been an immigrant church, he said, and while the new wave of immigrants today are Hispanic, there is a long and rich history of Hispanics here for over 500 years. Referring to a recent Pew study, he noted he was struck by the finding that while younger Catholics are more likely to be Hispanic, younger Hispanics are less likely to be Catholic. 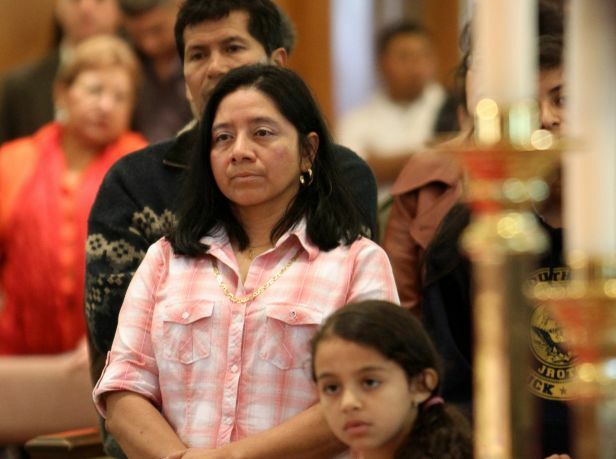 The study showed Hispanic Catholics have left the church for two reasons. First, they are drawn to other expressions of Christianity that offer a more direct and personal connection with God in lively and welcoming services in which they feel more comfortable. Second, they are attracted to the inspiration or outreach of a pastor or pastoral leader — which is what Pope Francis is calling the Catholic Church to do, saying the church cannot wait for people to come to it but must go to them. He also explained the broad cultural patterns that bind Latinos as identified by sociologists. Latinos are a high-context culture, he said, meaning one in which a person’s identity is connected with the people around them. They are family oriented. High-context cultures are oriented to the past, to history and tradition, while low-context cultures are oriented to the future. In addition, intrinsic to Latino culture is the Catholic culture. “Latino cultures are embedded, if you will,” said Chavez, “by Catholicism, pre-Trent Catholicism,” seen in folk traditions and devotions. And this Catholicism came in the context of colonization and “mestizaje,” a mixing of ancestries. While Hispanics have language and the Catholic faith in common, they also have differences, Chavez said. One of the primary differences is generational — not only differences in age but in the length of time they have been in the United States, he said, noting that as a result, class differences are acute. The result is cultural clashes that often occur on an unseen level, he said, much like two icebergs colliding, as was evident in recent racial shooting tragedies. “We are still dealing with tremendous aftereffects of the apartheid that was a part of this country’s history,” he said. The situation for immigrants in this country has always been one of assimilation, he continued, meaning people leave behind their language and culture and seek to blend in. This is internalized, especially in children, he said. Sowa is a staff writer at Today’s Catholic, newspaper of the Archdiocese of San Antonio.